Melody came to George wishing to improve the slight misalignment in her teeth. She mainly wanted to have a gentle improvement to her smile, and was concerned that they were only going to get worse with age. Melody has already had orthodontic (teeth straightening) treatment in the past and was still wearing a fixed retainer, which often contributed to the retention of food and stain build up. Melody's teeth had moved over the years and George's aim was to make sure that Melody would love her smile again. A quick and very effective course of Invisalign, followed by gentle teeth whitening, made Melody's already nice smile into an absolute perfection. *Invisalign is a world renowned teeth straightening system using series of near invisible, clear aligners used as a beautiful alternative to traditional braces with metal wires and brackets. Removable aligners enable you to eat, drink and brush your teeth as normal unlike braces which would always be in the way. Melody is absolutely thrilled with her results! This gentleman came to see Dr. George Angelidakis being fully aware of his overcrowded and discolored teeth. Due to very a demanding and public facing profession, he did not have a lot of time to spend on his teeth and so none of the brace treatments were a suitable option for him. However, a perfect result was an absolute must and it had to be achieved fast. The maximum time the patient was prepared to dedicate to his dental treatment was only 3 weeks. The amazing and very natural result was achieved in just under 3 weeks. Discoloration was fully rectified by an in-surgery whitening procedure. 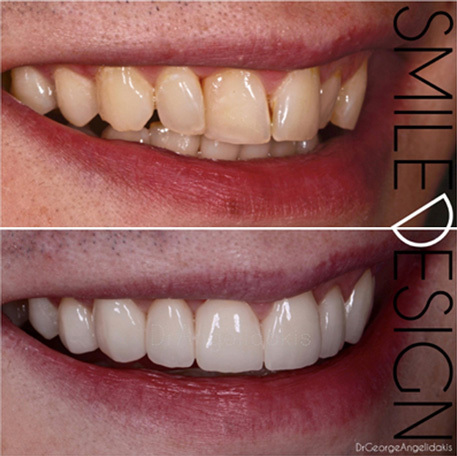 Once the desired color was achieved, George placed 8 very life-like, reinforced porcelain veneers to give the appearance of naturally white, straight and beautiful teeth. The patient could not be happier. This lovely lady came to see Dr. George Angelidakis being very unhappy with her two front teeth. Both teeth had very old crowns on them, which appeared very unnatural, thick and lifeless. Also, the two central teeth appeared significantly longer. Some of the lady's other teeth also had some heavy staining on them, which she has unsuccessfully tried whitening before. This patient did want a significant change but was after a very natural, non-obvious result. 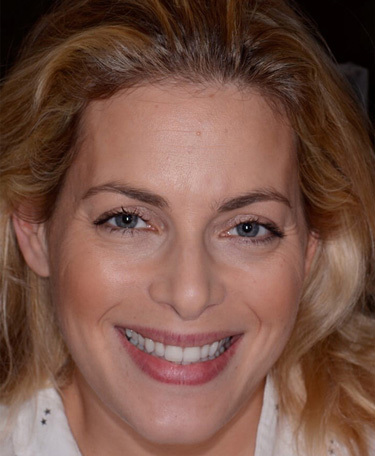 The amazing, natural looking result was achieved by replacing the old, opaque and thick looking crowns on lady's front teeth with new and thin but strong porcelain reinforced crowns, also known as EMAX crowns. EMAX crowns are specially made from extremely strong porcelain, which allows them to be made significantly thinner and thus have the high level of translucency identical to natural, healthy teeth. 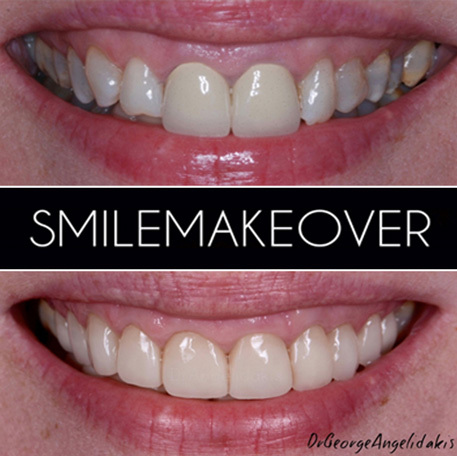 Veneers have been placed on the remaining teeth to even out the smile line and avoid some teeth looking shorter or longer than others. A blend of different shades was cleverly used to avoid the teeth looking too uniform, which has completely covered the discoloration yet made the appearance very lifelike. The patient was absolutely thrilled with the result. This lady came to Dr. George Angelidakis complaining of crowded teeth. She was especially concerned of her upper left second tooth appearing quite far behind the upper central one. Also, her canine teeth appeared very discolored especially in comparison with other teeth. This patient preferred not to go for any quick and permanent fix like crowns or veneers, but instead wanted to work with her natural teeth and see what can be done. 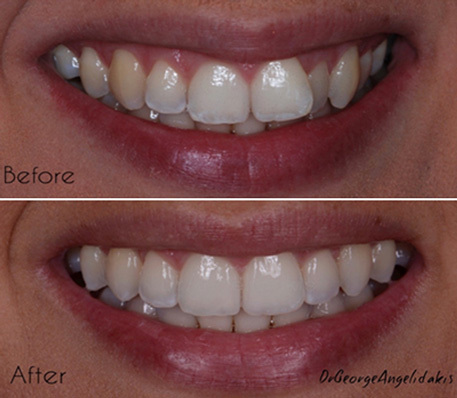 George provided the Invisalign treatment followed by teeth whitening upon the completion of treatment. Invisalign treatment consists of series of clear, nearly invisible trays that are continuously worn over a period of time and gradually move the teeth into perfect alignment. Invisalign trays are absolutely transparent and are nearly invisible when worn. They can also be taken out for comfortable eating and efficient teeth brushing. The final result in the "after" photo was achieved within 6 months. The patient was so pleased with the new appearance of her teeth and was surprised that the whole treatment took as little as 6 months. She so wished she came to see George sooner! This lovely lady hated her teeth ever since she was a teenager. She avoided getting braces because of how long it would take and the thought of having metal brackets and wires put her off completely in the past. Jose created a treatment plan of Six Months Smiles clear braces to close the gaps between her front teeth and straighten her wonky teeth. She was delighted with the result and says it has improved her overall confidence and now finds herself smiling all the time so she can show off her teeth! This young lady hated her crooked teeth. She had several consultations with dentists who told her that she would need to have teeth extracted and estimated the treatment length to be 18 months. She really didn't want to go through teeth extractions and had almost given up on her hope of having straight teeth, until she came to see Jose. 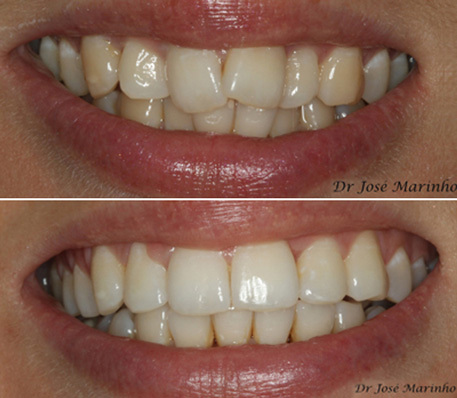 Jose created a treatment plan of clear braces for around 9 months and teeth whitening to polish it all off. The treatment was completed in 8 months, with no teeth extractions needed! The young lady was thrilled with the result and was relieved she made that last visit to see José and have her treatment completed. This lovely lady came to Dr George Angelidakis complaining of crowded, misaligned, misshapen and severely stained teeth. In addition to the regular external staining caused by coloured foods and beverages, this patient also had internal staining caused by medication and potential trauma to the teeth in the past. The upper right, front central tooth had already been restored with a crown in the past. The crown looked unsightly and a lot more opaque than other teeth. Being a busy medical nurse and having to constantly face the public in her day-to day-life, she wanted her smile to make her more confident and smiley rather than otherwise. George was able to provide the lady with an immediate visual mock-up. Visual mock-up allows the patient to see what the final result will look like before they commit to having the treatment done. In some cases, patients may even wear the temporary mock-up for several days and show their potential new smile to their friends and family. This is great for getting opinions and making changes before deciding on the final look. As soon as the final look was agreed, George and the patient proceeded onto two-weekly whitening course. 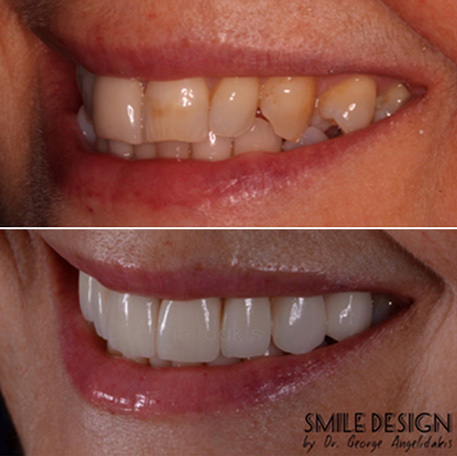 Once the desired shade was achieved, George replaced lady's old opaque and lifeless old crown on her upper right front tooth with a new cosmetic, reinforced porcelain crown. The rest of the teeth were restored with cosmetic porcelain veneers. 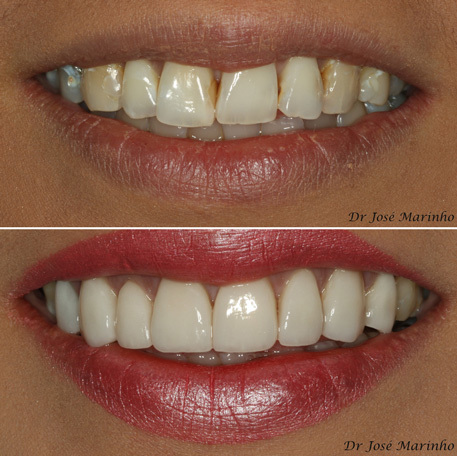 The result was a very natural, youthful and beautiful smile. The actual smile line was improved as well as teeth looking more uniform in their colour and length. The entire process took 1.5 months (including the two-week period spent on whitening). The lady was absolutely delighted with her new smile! This lovely lady was not happy with her smile. She was uncomfortable knowing people could see her discoloured and uneven teeth when she smiled and was also conscious that her metal fillings could be seen. Jose worked with this patient to create a treatment plan to address each issue, including Enlighten teeth whitening, a crown and 7 veneers. 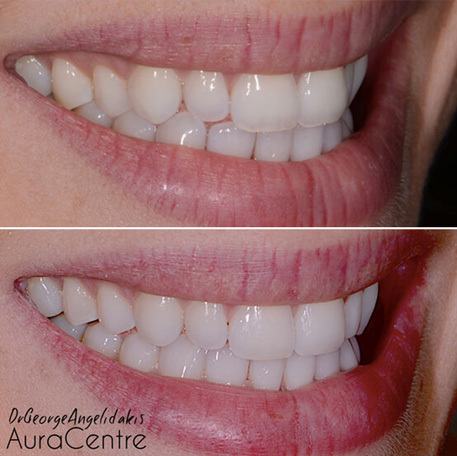 The patient was delighted with the result and now feels she can smile confidently and show off her teeth.